Along the Cote d'Azur in Nice, Provence in France there is a beautiful boat marina which lines the waterfront with the Parc du Chateau adorning the backdrop. Cars park along the waterfront of the Cote d'Azur in Nice, Provence in France as people head to their boat moored at the marina. Beautiful buildings border the marina which has plenty of space for boats of various sizes. They sit in the unique colored water that surrounds Nice with the beautiful green hillside of the Parc du Chateau in the backdrop.City of Nice Marina backdropped by the Parc du Chateau, Riviera, Provence, Cote d'Azur, France, Europe. 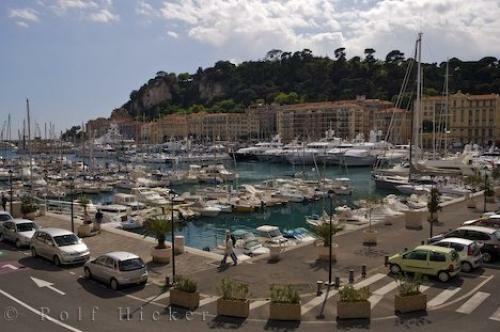 Photo of the boat marina which lines the waterfront of the Cote d'Azur in the city of Nice in Provence, France.